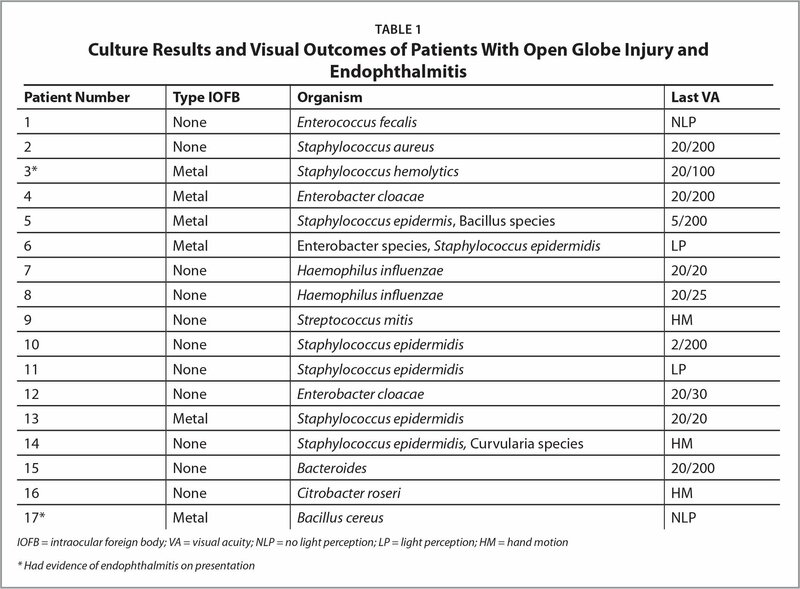 To report the visual and anatomical outcomes and microbiologic spectrum of culture-positive endophthalmitis in open globe injuries (OGIs) with or without intraocular foreign bodies (IOFBs). A retrospective, interventional case series of OGIs (n = 718) treated between 2004 and 2015. Patients underwent a management protocol for OGI, including systemic broad-spectrum antibiotics, on presentation. Culture-positive cases of endophthalmitis after open globe repair occurred in 2.1% of eyes (n = 15 of 718 eyes); two eyes had evidence of endophthalmitis on presentation. The most common organism was Staphylococcus species (five of 17 eyes). An IOFB was present in 6.8% of eyes (n = 49 of 718 eyes). All of these eyes received prophylactic intravitreal antimicrobials. In eyes with IOFB, the rate of culture-positive endophthalmitis after initial globe repair was 8.1% (n = 4 of 49 eyes) versus 1.6% (n = 11 of 669 eyes) in eyes without IOFB (P < .01). Culture-positive endophthalmitis was identified after OGIs more often in eyes with a concurrent IOFB. The incidence of retained IOFBs with OGIs varies depending on the mechanism of injury.1,2 In the presence of an IOFB, rates of endophthalmitis vary considerably and depend on the environment of injury.1,2,13–20 Most recent studies involving large numbers of IOFBs are based upon battlefield injuries.1,10 Data from civilian settings are limited.2–9 The purpose of this study is to report the microbiologic spectrum, as well as visual and anatomic outcomes of culture-positive endophthalmitis in OGIs with and without IOFBs in noncombat settings. We hypothesize that OGI with IOFBs have higher rates of culture positive endophthalmitis compared to eyes with OGI without IOFBs. The current study is a retrospective, interventional case series of OGIs with and without IOFBs managed at a tertiary referral center between 2004 and 2015. Patients were identified using relevant current procedural billing codes ICD-9 871.1 and 871.2 for open globe repair with or without the presence of an IOFB, respectively. Patients younger than 18 years were excluded from this study. Emergency room records, outpatient records, operative reports, and all other available existing data on each patient were reviewed. Patients were excluded if follow-up from initial presentation was less than 1 week. Since 2004 at the Bascom Palmer Eye Institute (BPEI), patients have undergone a standard management protocol for OGI including intravenous (third-generation cephalosporins) or oral broad-spectrum antibiotics (fluoroquinolones) on presentation or upon transfer from an outside hospital. Orbital computed tomography (CT) scanning with thin cuts was performed in eyes with suspected IOFB. Preoperatively, all eyes were subjected to a complete examination of the anterior and posterior segment with the use of ancillary imaging including ocular echography as needed. Retinal surgeons at BPEI performed globe repair with IOFB removal at the time of primary globe closure with pars plana vitrectomy if necessary. Patients with retained IOFBs received prophylactic intravitreal antimicrobials (vancomycin/ceftazidime ± amphotericin) at the time of globe closure. The crystalline lens was removed in cases of lens rupture or as needed to facilitate IOFB removal or posterior segment visualization. These patients were left aphakic at the time of repair. Subsequent secondary intraocular lens placement was performed as permitted by clinical status. Postoperatively, patients were placed on topical antibiotics, steroids, and cycloplegic agents. Culture-positive endophthalmitis was defined as clinical presentation consistent with endophthalmitis. This included the presence of hypopyon, level of inflammation, moderate or severe pain, and a positive aqueous or vitreous culture taken during globe repair or during the postoperative period. Microbiological records were reviewed and antibiotic sensitivity of the organism were documented. Clinical characteristics of OGI eyes with culture-positive endophthalmitis were compared to OGI eyes without endophthalmitis to identify possible differences. Statistical analysis was carried out using SPSS version 15 (SPSS, Chicago, IL). A Chi-square test and t-tests were used to determine the association between variables. Multiple logistic regression analysis was conducted to predict factors that were associated with decreased vision or development of endophthalmitis. A P value of less than .05 was taken as a level of statistical significance. The current study included 718 patients with a mean age of 51 years (range: 18 years to 98 years). The mean length of follow-up was 12.32 ± 9.31 months. IOFBs were present in 6.8% of eyes (n = 49 of 718 eyes). The mean age of patients with IOFB was 37.3 ± 11.29 years as compared to 51.96 ± 22.56 years for eyes without IOFB (P < .01). Of the patients with IOFB, 94% (n = 46 of 49) were male and 6% (n = 3 of 49) were female (P < .01). The most common foreign bodies were metallic (70%; n = 35/49) and glass (22%; n = 11 of 49). Among patients with IOFB, 51.0% (n = 25 of 49) had removal of the crystalline lens at the time of primary repair. All patients with IOFB (n = 49) received prophylactic intravitreal antimicrobials (vancomycin/ceftazidime ± amphotericin) during repair; eyes without IOFB did not receive prophylactic intravitreal antimicrobials. Two eyes with IOFBs had evidence of clinical endophthalmitis on presentation prior to globe closure. Culture-positive cases of endophthalmitis after open globe repair occurred in 2.1% of eyes (n = 15 of 718 eyes). Table 1 lists the organisms recovered in eyes with culture-positive endophthalmitis. All eyes with culture-positive endophthalmitis were treated with intravitreal antibiotics (vancomycin/ceftazidime). Endophthalmitis occurred in 8.1% of eyes with IOFBs (n = 4 of 49) after open globe repair and IOFB removal versus 1.6% of eyes (n = 11 of 669) without IOFB (P < .01). Among eyes with metallic IOFBs, 11.4% (n = 4/35) of eyes developed culture-positive endophthalmitis. Upon presentation, patients underwent surgery as soon as possible. In this retrospective study, data regarding time to surgery were limited. Time from injury to surgery data were available on 386 patients. For data analysis, timing data were divided into two groups: an early group (eyes with time from injury to surgery of less than 36 hours) and a delayed surgery group (eyes with time from injury to surgery of greater than 36 hours). In the early surgery group (n = 328), the mean time from injury to surgery was 17.09 hours ± 7.8 hours. In the delayed surgery group (n = 58), the mean time from injury to surgery was 96.55 hours ± 74.85 hours (range: 37.3 hours to 353 hours). In eyes with IOFB, 69.3% (n = 34 of 49) were in the early surgery group (< 36 hours after injury) and 18.3% (n = 9 of 49) were in the delayed surgery group (>36 hours after injury). There was no significant difference in time from injury to surgery in eyes that developed endophthalmitis and eyes that did not develop endophthalmitis. (Table 2). In eyes with culture-positive endophthalmitis, the mean presenting visual acuity (VA) was 20/1,000 (logMAR 1.83 ± 1.01) and the final VA improved to 20/800 (logMAR 1.53 ± 1.19) (P < .48) after treatment. Of eyes with IOFBs, 30.6% (n = 15 of 49) had retinal detachments (RDs) or retinal breaks; eyes with a RD had a final VA of 20/1,000 (logMAR 1.84 ± 1.05) compared to 20/100 (logMAR 0.77 ± 1.24) in eyes without RD or retinal breaks (P < .01). Final VA for eyes in the early surgery group was 20/400 (logMAR 1.30 ± 1.2) compared to 20/800 (logMAR 1.49 ± 1.16) for the delayed surgery group (P < .71). The current study is one of the largest of IOFBs in the civilian setting compared to reports of OGIs with endophthalmitis in the literature. Injuries took place in a variety of settings, including urban and rural environments. OGI with IOFB occurred more often in younger patients when compared to OGI without IOFB. In this study, the overall rate of culture positive endophthalmitis, 2.1%, is lower than most reported culture positive rates in literature (Table 2).1,2,9–12,20–26 Two of the 718 (0.2%) eyes with endophthalmitis were clinically diagnosed prior to surgical repair, whereas 15 (2.1%) developed endophthalmitis after open globe repair. The current rate of endophthalmitis is higher than the rate found by Colyer et al., a study that included OGI caused by IOFB associated with exploding ordnance, which may have had a sterilizing effect on the IOFB.1 In the current study, the most important risk factor for the development of endophthalmitis was the presence of an IOFB. Based on the limited number of eyes with IOFB that developed endophthalmitis, there was no increase based on the type of IOFB. Undergoing lensectomy did not increase rates of endophthalmitis. The use of intravitreal and systemic antibiotics may have influenced the low rate of culture-positive endophthalmitis in the current series. On presentation, before reaching the operating room, all patients with OGI received systemic antibiotics. The route of the anti-biotics (oral vs. intravenous [IV]) depended largely on the preference of the referring physician, as antibiotics were usually started prior to transfer to our facility. In the current study, IOFBs were removed at the time of primary globe repair by attending retinal surgeons. The timing of IOFB removal depends on a number of factors, including the patient's health status, the presence of other injuries, the injury's environmental setting, the IOFB's composition, and the availability of operating room ophthalmic surgery-trained staff.27–28 As an example, farm injuries with contaminated IOFBs are poorly tolerated compared to heated projectiles encountered in combat settings, and thus require more urgent removal. The composition of the IOFB is also an important factor: glass IOFBs produce less inflammation and are less toxic compared to copper IOFBs or vegetable material IOFBs, both of which rapidly produce severe inflammatory responses.27–28 Primary closure of OGI and IOFB removal was made possible with available on-call retinal surgeons and trained operating room staff. In other settings, such as the combat theatre, personnel, and equipment required for IOFB removal are not always available. Delaying IOFB removal and primary globe closure in this situation may be more feasible. The impact of timing of IOFB removal on rates of proliferative vitreoretinopathy (PVR) and endophthalmitis is controversial. Most recent studies have reported no increase in endophthalmitis or PVR associated with delayed IOFB removal.1,2 The current study involves a referral center for a large geographic area, meaning logistics may delay presentation for several days after injury. Although a prospective study would be required to address the impact of time to IOFB removal on rates of endophthalmitis, the current study found no increase in rates of endophthalmitis or poorer visual outcomes associated with delays of IOFB removal of up to 36 hours. Eyes that had surgery more than 36 hours after injury included eyes with occult foreign bodies, IOFBs not identified on initial examination at the outside facility, and two eyes with endophthalmitis on presentation. However, the current study's retrospective approach makes it difficult to draw firm conclusions on the impact of timing on outcomes. Eyes that developed endophthalmitis had a variable clinical course: two eyes developed NLP vision and two eyes developed LP vision. Eight eyes with endophthalmitis had a final VA less than 20/400, a finding comparable to visual outcomes reported by Essex et al. and Lieb et al.11,29 In the current study, delays from injury to globe closure/IOFB removal did not significantly impact rates of endophthalmitis or visual outcomes. Delays may occur due to patient transport issues, perioperative considerations including coexisting systemic injuries, and operating room and surgeon availability. While in the current study there were operating room staff trained in ocular surgery and fully equipped operating rooms available 24 hours a day, according to the 2015 Preferences and Trends (PAT) Survey, most retinal surgeons (62%) operate at ambulatory surgery centers that may lack such personnel and resources.30 These findings suggest that delaying repair up to 36 hours after injury may allow surgery by a more experienced surgeon with better trained operating room staff and may not adversely impact outcomes. In eyes that developed endophthalmitis, Staphylococcus species was the most common infectious organism, present in 29.4% of cases (five of 17). Additionally, there were three cases of Staphylococcus species growth in mixed organisms culture results. The organism prevalence of this study parallels that of Long et al., which found Staphylococcus species in 40.8% of isolates (146 of 358) in endophthalmitis after open globe injury.35 Among the Staphylococcus species in this study, S. epidermidis was the most common causative pathogen, responsible for 35.3% (6/17) of culture-positive endophthalmitis. The prevalence of S. epidermidis found in this study is consistent with the current literature.10, 35–37 In eyes with IOFB that developed endophthalmitis after open globe repair and IOFB removal, S. epidermidis was the causative organism in 75% (three of four). Similarly, Al-Omran et al. found that IOFBs are commonly associated with S. epidermidis posttraumatic endophthalmitis.36 The prevalence of Bacillus and fungal endophthalmitis was much lower than Staphylococcus species. Bacillus constituted 11.7% of endophthalmitis (two of 17), and no fungal endophthalmitis was found. The limitations of the study include its retrospective nature and the relatively low rate of culture-positive endophthalmitis after OGI. Establishing the impact of time to surgical repair on rates of endophthalmitis or visual outcomes would require a randomized, prospective study. Given the unpredictable nature of trauma, such a study would be logistically difficult. There is considerable variation in injuries induced by an IOFB depending on factors that cannot be controlled for, such as the environment of injury, the size and the composition of the IOFB, and the mechanism of injury. Also, the current study had a wide follow-up range (weeks to years) due to some patients continuing their care with their local ophthalmologists after repair at our institution. Furthermore, multiple surgeons selected the management strategy and this individual surgeon bias may have influenced the outcomes. In the current study, 15 eyes developed culture-positive endophthalmitis after OGI repair. There was no difference in rates of endophthalmitis based on time from injury to surgical repair. All patients received broad spectrum systemic antibiotics (oral or IV) immediately upon presentation; eyes with IOFB received prophylactic intravitreal antibiotics at the time of globe repair. Visual outcomes varied considerably based on the extent of injury. Verbraeken H, Rysselaere M. Post-traumatic endophthalmitis. Eur J Ophthalmol. 1994;4:1–5. Aaberg JT, Sternberg P. Trauma: Principles and techniques of treatment. In: Ryan S, ed. Retina. 3rd edition. St. Louis, MO: Mosby; 2001; 2400–2426. Narang S, Gupta V, Gupta A, Dogra MR, Pandav SS, Das S. Role of prophylactic intravitreal antibiotics in open globe injuries. Indian J Ophthalmol. 2003;51(1):39–44. Jiang CH, Zhang MN. Traumatic endophthalmitis following penetrating ocular injuries with retained intraocular foreign bodies. Chin J Traumatol. 2003;6(3):167–170. Stone T. Global trends in retina. Paper presented at: American Society of Retina Specialists Annual Meeting. ; August 24–28, 2013. ; Toronto, Canada. .
From the Department of Ophthalmology, Bascom Palmer Eye Institute, Miller School of Medicine, University of Miami, Miami (TPB, AJM, BDW, FMJ, AEK, NR, FVC, TAA, AMB, JS, NZG, JHT, JWF); and the Retina Group of Washington, Washington, DC (EDW). This research is funded in part by NIH Center Core Grant P30EY014801 (Bethesda, Maryland), Research to Prevent Blindness Unrestricted Grant (New York, New York), and the Department of Defense (DOD Grant #W81XWH-09-1-0675) (Washington, DC). The sponsor or funding organization had no role in the design or conduct of this research. Dr. Gregori is a consultant to Regeneron and is supported in part by NIH Center Core Grant P30EY014801 (Bethesda, MS) and a Research to Prevent Blindness Unrestricted Grant. Drs. Flynn Jr. and Relhan are supported in part by NIH Center Core Grant P30EY014801 (Bethesda, MS) and a Research to Prevent Blindness Unrestricted Grant. The remaining authors report no relevant financial disclosures. Address correspondence to Harry W. Flynn Jr., MD, Bascom Palmer Eye Institute, 900 NW 17th St, Miami, FL 33136; email: HFlynn@med.miami.edu.